Rentals & Hire purchase From £25 a month. 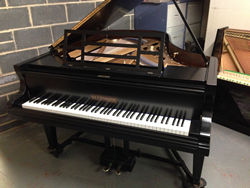 Specialists in Pianos New or Used, we buy, sell, rent, hire, restore & re-polish. If you are looking to rent or purchase a piano we have a selection to choose from. The Majority of our Upright & Grand Pianos are available on a rental or 0% Interest hire purchase contracts. We try to be as flexible as possible in order for you to acquire the correct instrument for your Musical and Financial needs. Piano Re-polishing Various Colours & Finishes. Here at Paregal Pianos we aim to give value for money without compromise in quality. Established in Restoration & Re-polishing of all types of Pianos for Piano dealers (local & overseas), with a combined experience of over 4 decades. Our in depth knowledge of both the Instruments & the Woods used places us in a particularly unique position within the Piano & Polishing trade. A position we strive to maintain with both integrity & craftsmanship. We deal in a wide variety of Pianos traditional & modern suitable for Everyone, from the Novice to the more Advanced Pianist. Rentals or Hire to Buy deals starting from £20.00 a month for a Upright & £50.00 a month for a Grand. 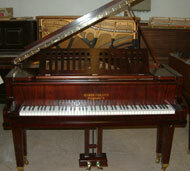 You can purchase a second hand 'Paregal' Piano, Re-polished & Restored from £950.00. We also deal in German & Japanese Pianos and highly sought after English makes such as Knight, Marshall & Rose, Challen, Chappell, Rogers, Kemble, Zender, Eavestaff etc.. With a carefully selected range of reconditioned uprights & an equally discerning selection of Used baby grand pianos for sale from £1650.00, we are sure you will agree we have tried to encapsulate all tastes and requirements. Whatever your query, whatever your needs, give us a call. And remember, you can try it before you buy it, with our Piano Rentals & Hire Purchase Schemes, based in wakefield near leeds but covering the whole of west yorkshire & the uk, england, scotland & wales, distance is no problem contact us for more details. The Restoration & Re-polishing of Pianos is a highly specialized field requiring a thorough working knowledge of both the woods (cabinet) and the instrument within. In fact if you have ever visited a Piano showroom in the north there is a strong likelyhood you have already seen our work as we turned over in excess of 300 Pianos a year for the Piano Trade. We specialize in commissioned Restoration and Re-Polishing work, several examples are on our Restoration & Polishing Portfolio page, and pride ourselves on the quality of work we produce, from re-polishing in satin or gloss finishes to full Reconditioning. Pianos New, Used, Sales & Rentals © Copyright. Paregal Pianos.